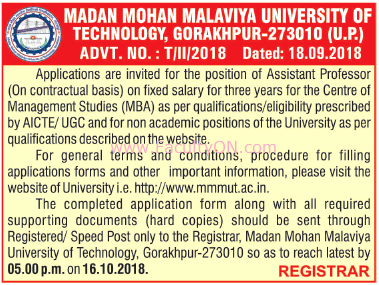 Madan Mohan Malaviya University of Technology, Gorakhpur has advertised in THE TIMES OF INDIA newspaper for the recruitment of Assistant Professor jobs vacancies. Interested and eligible job aspirants are requested to apply on or before 16th October 2018. Check out further more details below. Application Fee: Rs.1200/- for General and Rs.600/- for SC / ST. Fee should be paid as DD in favour of Controller of Finance, M.M.M.University of Technology, Gorakhpur. How to Apply: Interested and eligible candidates are requested to send completed application form along with photocopies of claim made in application and applicable fee to the following address through only registered or speed post.